AltStreamOverlay - A windows shell extension to show NTFS alternate stream information. Bugfixes - thanks to various folk for spotting! Details at bottom. This is a little tool I knocked up in the course of investigating NTFS alternate streams - there's some very good documentation out there, but I couldn't find a decent explorer plugin. 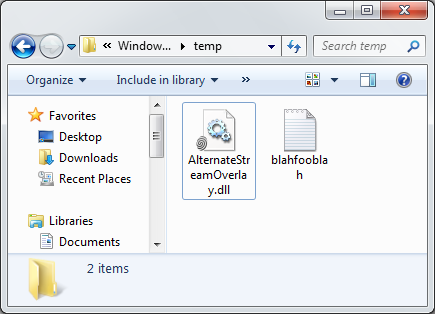 Flexhex has some excellent documentation on alternate streams, so I won't overly bore you, but in summary - NTFS (the filesystem used in Windows since NT) allows a file to contain more than one data stream. The primary one is the one you're used to seeing, but there can be more. Where might they be used? Any number of reasons - for example, internet explorer adds an extra stream to files to tell where they've been downloaded from! Allow you to browse the content of the alternate streams in the properties of the file. Looking at a directory with a file downloaded with internet explorer - note the superimposed fingerprint over the icon. 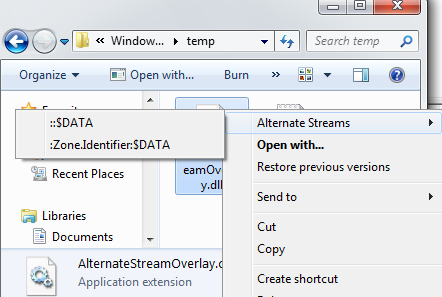 The context menu now shows (if applicable) a list of the alternate streams. 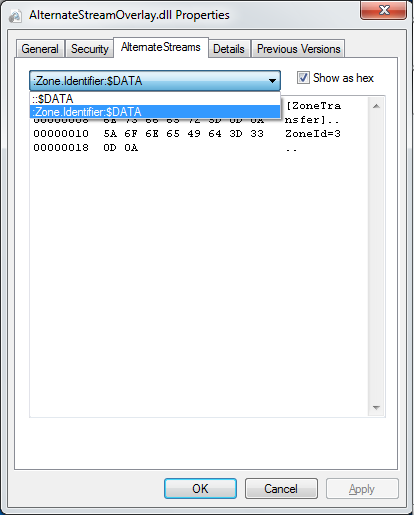 This file was downloaded using Internet Explorer - it's added an extra stream "Zone.Identifier" to supply metadata about where the file came from.